Shazmina Bendi designs......: Pssst! Over here!!!!! Lots to tell, or rather not tell. I have been off the radar for a little while as there has been some developments in other parts of Shazmina's life, which I wont discuss here. Most of you know what I am talking about! :) Needless to say it would be better off in a whole other type of blog! So craftwise, I have been working on a project for a friend that I miss alot. It meant starting a project that was not on either my started list or my potential project list, but it is worth getting even further behind. 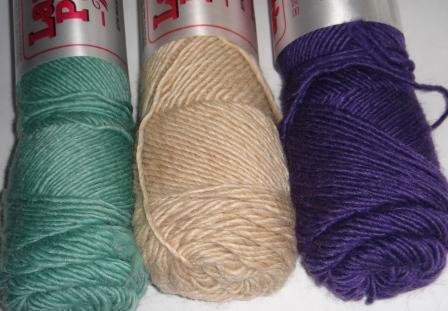 Here is the delicious wool I am using. 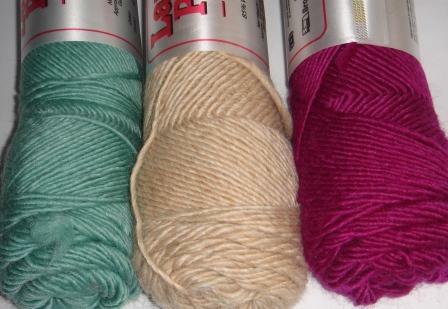 Lambs Pride Worsted, in Clematis (purple), Oatmeal, Seafoam and Fuschia. Yum! The weather is starting to get warmer (I heart spring in Sydney! ), so I am even less motivated to complete the Skully jumper. I am also procrastinating as I have to pick up stitches around the armhole to start the sleeve. Yuk, picking up stitches, that is so not my favorite thing to do. Ooo that wool is beautiful! I been waitin' forever for your update! I would't even consider picking up stitches, don't think I'd cope, so I just avoide those patterns altogether! I am a Buzzy Bee!